Slade have done it again!!! They waste no time. Straight to number one goes "Skweeze me Pleeze me". Talking about records, Slade are the only group to equal the Beatles record of No.1 consecutive hits. Jim and Nod were very pleased with their box loads of birthday cards! As soon as they saw them they told me to tell you all "Thanks very much - and we would not know what to do without you all. Thanks again". They then went through the cards and read out loud the funny ones and also the jokes that some of you put inside. It's also Don's birthday soon, on the 10th September. I have received a large amount of "Get Well" cards for him. He hasn't seen them yet but Nod is coming into town soon and he said he would take them back. I can now supply the sheet music for "Skweeze me Pleeze me" and for the first time it has a colour picture of Slade on the front cover. It's sold in the shops for 20p, but for Fan Club members it is only 15p. Just send a 15p Postal Order or cheque to me and I'll send it off to you as soon as possible. A lot of people have enquired about the glitter T-shirts with "Skweeze me Pleeze me" on them, as seen on "Top of the Pops" and the Sun newspaper. We have only a limited number so this offer is only open for members. The T-shirt$ cost £1.00 plus 10p post and packing. Just send me a letter enclosing the remittance and size required (Small, medium or large) and not forgetting to put "TS" in the top left hand corner of your envelope. This offer is subject to availability. Just phoning up to do my little bit for the Fan Club News­letter. At the moment it's pouring down with rain - maybe it's something to do with St. Swithin's day! And I wanted to do some sunbathing, too, to expose my beautiful body to the sun!! Don's condition is satisfactory, in fact he's recovering quite quickly. I've been along most days to see him, and he's very cheerful. He's even watching a lot of television and he's quite knocked out with some of the kiddies programmes. Dave's gone over to Los Angeles and Jim's gone to South Spain lucky devils, leaving me at home to use my tremendous brain power to think of words for our new songs. Nice to see you all at Earls Court and those at the Isle of Man. Very sorry to hear about those that cancelled their tickets before realising that the Isle of Man was still on. And let's have a bit of a shout for Frank Lea, Alright, Alright, Alright!!! Slademania reached new heights last month, when 20,000 fans crammed into London's Earls Court to see Nod, Don, Jim and Dave. The Earls Court concert was both vast and visible from all points, then there was a huge PA system 11,500 watts flanking the stage, but what topped the lot was a giant screen high in the sky on which a video TV system beamed close-up pictures of the whole affair. For the fashion-conscious fans, Don Powell chose an all-white ensemble with narrow black pinstripes. It had matching waistcoat and trousers flared from the knee, and his boots also matched. Jim Lea wore a smart red lurex suit, a black T-shirt, and red boots. Dave Hill had silver glitter round face and hair. Trousers worn over silver boots, and a long coat embroidered in shining blues, blacks and golds. Noddy Holder as usual had a black top hat with mirrors, a red shirt, matching check waistcoat and trousers, and red tail coat. The music started and the noise was quite shattering from both group and fans. First number was "Tak me bak 'ome". The show developed in much the same manner as all Slade's shows. The songs came thick and fast, there was the usual Football chant, which is now compulsory, as supporters of Arsenal, Chelsea, Spurs and West Ham bellowed their allegiance before breaking into an unaccompanied "You'll never walk alone" and Slade came back for an encore of "Mama weer all Crazee now" which was sung by all. 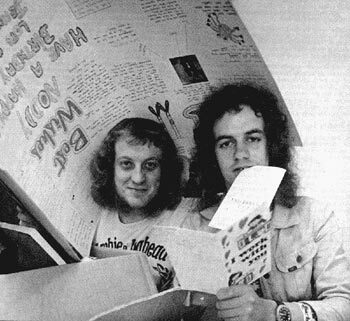 Slade were on the point of being told to leave their London hotel, the Holiday Inn in Swiss Cottage during the week-end of Earls Court, because the management was tired of fans clamouring to see the group .... "Skweeze me Pleeze me" sold over 300,000 in the first week of release ... "The Best of Slade" is planned for September release, and six weeks later a new studio album will be released .... A European Tour is planned for October .... A new single has been released in the States taken from the album "Slayed" and called "Let the good times roll". Over the last few months Slade's Roadies have been pestering me about giving them some of the limelight. These are the back room boys who make the whole show possible. The team is made up of Stage Manager Rod Wilson, a Scot who has worked with Slade for six years, Sound Engineer Charlie Newnham, Tour Manager Graham Swinnerton, and the strong arm men of Johnnie Johnson, Mick Rossie and Haden Donovan. The Road Crew always arrive some six hours before the doors of the venue are open to the public, in which time they assemble cabinets, enormous bass reflex horns, amplifiers, a custom built 16-track mixer, Don's drums and miles of cable. Everything has it's place and there is no room for mistakes. A mistake while plugging in a cable into a socket could short-circuit the whole PA, causing thousands of pounds of damage. The usual diet consists of 31bs of chips, half a dozen Steak pies and a gallon of Coke a day. There is no set time for meals, or sleep for that matter. It's a case of getting as much done as you can when you can. They may look ferocious but in reality they are a terrific bunch. Jim's 18 year old brother Frank is by trade a plumbers mate. Frank has been taking drumming lessons from Don and has travelled with the group on numerous occasions. What better man for the job? On Friday he rehearsed with the group. On Saturday his picture appeared in the papers and on Sunday he was the hero of 4,000 fans who turned out to witness this historical gig. And what a reception the fans gave Frank when Noddy introduced him. The show itself ran like all Slade's shows - the only number they cut out was Janis Joplin's "Move over Baby" which features plenty of tricky drum work. The rest of the Slade ingredients were all there, and when it was over the group celebrated in grand style - but spare a thought for Frank. On Tuesday morning he was due to return to plumbing again at 7.30 am!! Look out for Melanie magazine on sale September 1st with a free Flexi-disc of Slade. It is remarkably good and well worth having in your collection. Must close now. See you all soon. When a girls meaning yes she says no. You the way Then you'll know.